A beautifully balanced production of a family in a precarious position of Albee’s quietly bristling play. Well worth a visit to see masters navigate the difficult journey through Albee’s play. But first: After a few fraught weeks of revelations of the allegations of sexual harassment, bullying and inappropriate touching against Albert Schultz, former Artistic Director of Soulpepper Theatre Company, A Delicate Balance opened at Soulpepper. I held my breath and entered the Young Centre with a sense of heightened anticipation, wondering what the mood would be like. The mood seemed buoyant or was that over-played? The theatre was packed. At curtain time, Alan Dilworth, acting Artistic Director wearing a shirt, vest and jeans, stepped on stage and the place erupted in a long, loud ovation for him. He seemed touched. He told us his name (how rare is that!) welcomed us and thanked us for coming out to the theatre to see a play. Then he left and I exhaled and this wonderful production began. The Story. On the surface it appears that Tobias (Oliver Dennis) and Agnes (Nancy Palk) have a happy marriage. He listens to her musings, makes the drinks while she natters on about the possibility of losing her mind and he says she’s the sanest person he knows. They seem to amuse each other in a quietly tasteful way. But then Agnes’ easy banter becomes brittle and critical when Agnes talks about her prickly sister Claire (Brenda Robins) who lives with them. Claire drinks, a lot, and it becomes clear that Tobias acts as a referee between Agnes and Claire. Tobias and Agnes have daughter Julia (Laura Condlln) whose fourth marriage has failed. Julia’s husband never agrees with her, she can’t cope with that rigidity and is coming home to mommy and daddy for comfort. Tobias and Agnes are accommodating hosts to their best friends Harry (Derek Boyes) and Edna (Kyra Harper), but when their friends move in because of some unknown terror Harry and Edna experience, then emotions run high, although the volume of the voices does not rise much. The Production. The audience sits on either side of the playing area that runs the length of the theatre. Astrid Janson’s well-appointed living room set establishes that Tobias and Agnes have money and the taste that goes with it. The first thing you see is a huge long (Persian) rug of vibrant reds that runs the length of the living room. Arranged on the rug are a sofa, chairs, and a liquor cabinet. There are entrance points at either end of the playing area. But something is wrong. One corner of the rug curls up and rests on the wall in the far stage left (from my side of the audience) corner of the theatre. This is deliberate as if something is bubbling up underneath the very foundation of the house. And it’s true Janson’s design suggest this in the subtlest of ways with that upturned corner—as if all the unspoken truths, accusation and hurts have bubbled up to be confronted by the family who looked the other way and didn’t face their demons. Director Diana Leblanc establishes a sense of decorum with Agnes and Tobias. The talk is quiet and respectful. Harshness is to be avoided at all cost. Agnes does not address prickly issues and Claire always does, which would account, in part, to Agnes’ antagonism towards Claire, that and her drinking. Graciousness is the watchword of Agnes. Nancy Palk as Agnes is both gracious and seemingly pleasantly welcoming to her unexpected and uninvited guests Edna and Harry. She tries subtly to find out why they have come. Claire blurts it out. 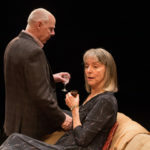 Still Leblanc keeps the delicate balance of the play on even footing, never allowing it to tip either into biting argument in tone or total obliviousness—these characters are watchful, ready for a weakness to reveal itself and then they can pounce. As Claire, Brenda Robins has that comical directness down pat. She strides into a room and practically takes it over. When Claire plots how to get even with Agnes, Robins assumes a sly sneer, the humour is cutting. Making people feel uncomfortable by taking them out of their pretence is how Claire operates and Robins does it beautifully. Palk counters with her own barb but in a subtler way. As Tobias, Oliver Dennis is courtly in his efforts to mediate between the sisters, his daughter and Harry and Edna. While Agnes we learn is really the head of the family, Dennis does not make Tobias an overt wimp. He stands his ground as a man who knows his wife has all the strength. Still Dennis imbues Tobias with a wistfulness of a man who ties hard and knows he has to because his wife is watching. Laura Condlln is an unsettled, fraught Julie because her marriage has failed again and instead of coming home to comfort, she comes home to find Harry and Edna are in her room and they aren’t leaving. And finally Kyra Harper as Edna and Derek Boyes as Harry, both put up that façade to hide their fear. They have the confidence their friends will take them in and the arrogance to tell those friends how to handle their daughter, decorate the room, even serving drinks. A Delicate Balance suggests a subdued world that is ready to boil over because of all the manners that hide the ugly bits. Diana Leblanc delicately guides the production to gradually, eventually reach the boiling point. Masterful. Comment. Of course we can all find echoes of what is happening around Soulpepper to references in the play. Everybody has secrets in this play that others know about. There might have been sexual impropriety in Tobias’, Harry’s and Claire’s past that is touched on, but not fully revealed. Emotions simmer before there is wrenching disclosure. But A Delicate Balance is rich on its own merits without reference to Soulpepper’s woes. Edward Albee knew first hand of the upper class world and family of Tobias and Agnes. His own family was upper class and wealthy. His parents bickered and snipped at each other. His mother did not have much respect for her talented playwright son and never hid it. Albee knows of the many ways to hurt and sting with a word, a phrase or a fraught situation because he learned it from his family. That’s the world he has created in this complex play and it’s beautifully realized in the production. Closes: Feb. 17, 2018. Held Over!